1.Preheat oven to 375°. Spray 2 rimmed baking pans with cooking spray. 2.In medium bowl, stir pumpkin, 1/4 cup plus 1 tablespoon sugar, pumpkin pie spice and salt. In small bowl, stir cinnamon and remaining 1 tablespoon sugar. 3.Unroll dinner rolls onto prepared pans; separate into 16 triangles. Spread about 1 tablespoon pumpkin mixture on each triangle; starting at wide end, roll up triangles into crescent shapes. Sprinkle with cinnamon mixture. 4.Bake 12 minutes or until golden brown being careful not to let bottoms brown. 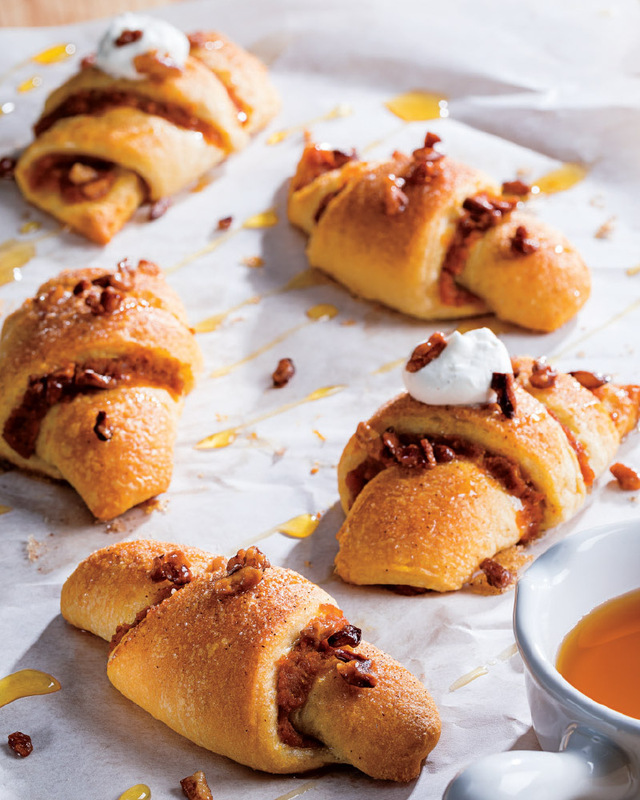 Serve immediately with whipped cream, maple syrup and pecans, if desired. For easier handling of dinner rolls, keep them refrigerated until ready to open and unroll. Use leftover filling to flavor pancake or waffle batter; or mix with 1 cup softened cream cheese, 1 cup sour cream and 3/4 cup powdered sugar and serve as a dip with apple slices and gingersnaps. > Pumpkin is filled with fiber, potassium and vitamin C, all of which support heart health. Stock up on canned pumpkin this season and add it to almost any dish for a nutritional boost. Some ideas include stirring into oatmeal, mixing with applesauce, spreading on top of a bagel with a drizzle of maple syrup, mashing along with white potatoes or mixing into a smoothie.